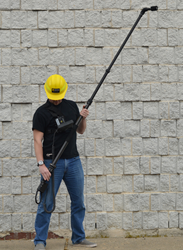 New Inspection Zoom Camera with Articulating Head Has Been Launched by Medit Inc.
A new telescopic pole camera with 2-way articulation and a 10x optical zoom. The camera is a perfect fit for law-enforcement and security related applications as well as for manhole and sewer inspection. Medit Inc. has presented an innovative INSPEKTOR inspection zoom camera ( http://www.fiberscope.net/zoom-inspection-camera.html ) with 2-way articulation (180 degrees total or 90 degrees in each direction) and a 10x optical zoom. The waterproof and submersible telescopic pole consists of three durable break-proof aluminum sections and a fibreglass section containing the pulls that provide the articulation mechanism. Extra sections may be added by the user, thus extending the total length of the pole up to 40 ft (just over 12 meters). The camera head diameter is 2.5'' (63mm), which allows navigation through tight spaces and narrow passages. Two-way articulation is controlled via a convenient and intuitive twist hand grip. A twist collar allows the camera angle to be locked in a desired position. The zoom function allows the inspection of objects and areas located within the range of 1ft to 200 ft from the camera. The live image is visualized onto a color 5.6'' display with built-in DVR. A special low light sensitive camera chip ensures good quality even in spaces with insufficient lighting, while 24 bright white LEDs illuminate the inspection area. Such image adjustments as contrast, brightness or color are easy to control from an onscreen menu. Photos and video recordings made during the inspection are saved to an SD card. Therefore, the memory of the device is limited to the memory of the card. For instance, a 32GB card is able to store up to 7500 photos or 30 hours of video. The U.S. built INSPEKTOR camera is supplied with two rechargeable NiHM batteries, a handy chest harness, a right angle adapter and a break-proof carrying case made of hardened plastic. Camera head options include a thermal and an infrared heads. This inspection zoom camera is ideal for security, law-enforcement and military-related applications such as search for explosives, weapons, drugs, or contraband. It can also be used for manhole and sewer inspections.